Step back in time as you board our 1950 woody to the historic Thunderbird Lodge. Cruise includes a light continental breakfast, walking tour of the Thunderbird Lodge and picnic style lunch on the property. Tuesdays through Saturdays. 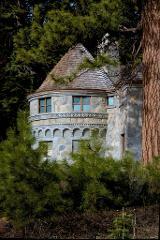 In partnership with the Sierra State Parks Foundation, Cruise Tahoe is offering the Emerald Bay Cruise and Vikingsholm Castle Walking Tour. The cruise includes wine, light appetizers, and lots of Tahoe History. Sundays through Wednesdays.